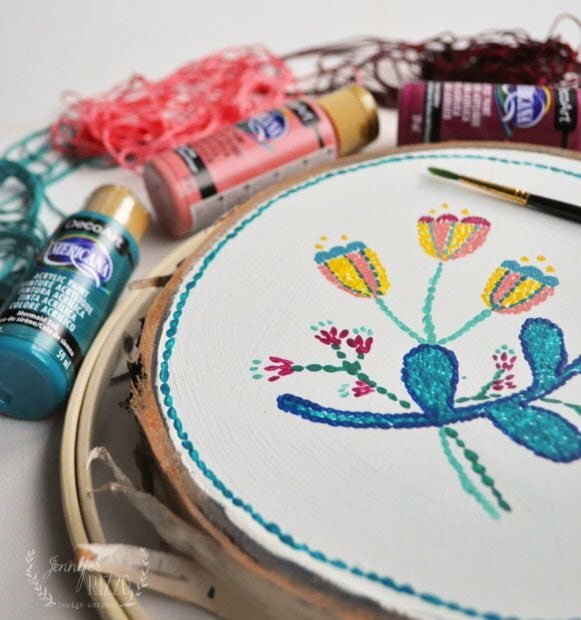 Have you ever embroidered? Regular embroidery is not something I’ve done a lot of, but I recently came across punch needle embroidery and was intrigued. I decided it was something I could tackle, and immediately ordered a kit and a bunch of beautiful thread. Well, after stabbing myself twice, and drawing a little blood, I realized there is a bit of a learning curve to it. It’s a good reminder that I don’t have to be a rockstar in every arena of crafting (as hubby reminded me… there was the great macrame debacle of 2016.). It is something that I am going to continue to practice. 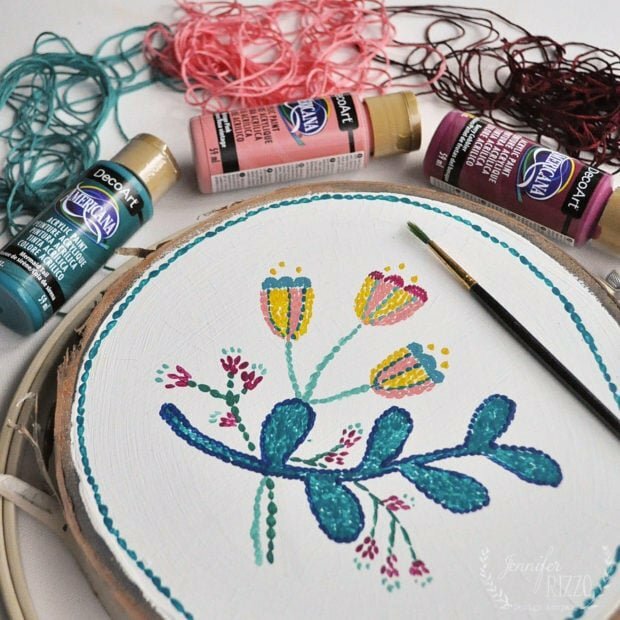 In the mean time, I wanted to share a project with you that will give you the look without physical injury…punch needle embroidery painting. 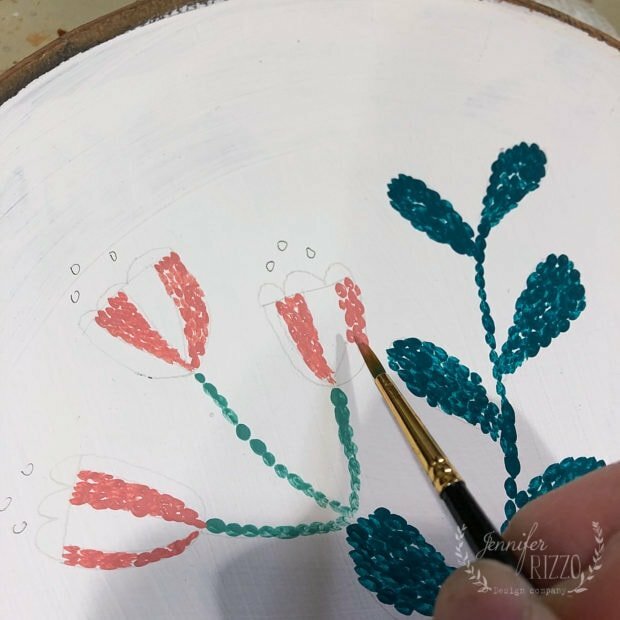 A thin-tipped paint brush, craft paint, some paint supplies like water, and paper towel, a surface to paint on such as a wood slice, and you are ready to go! 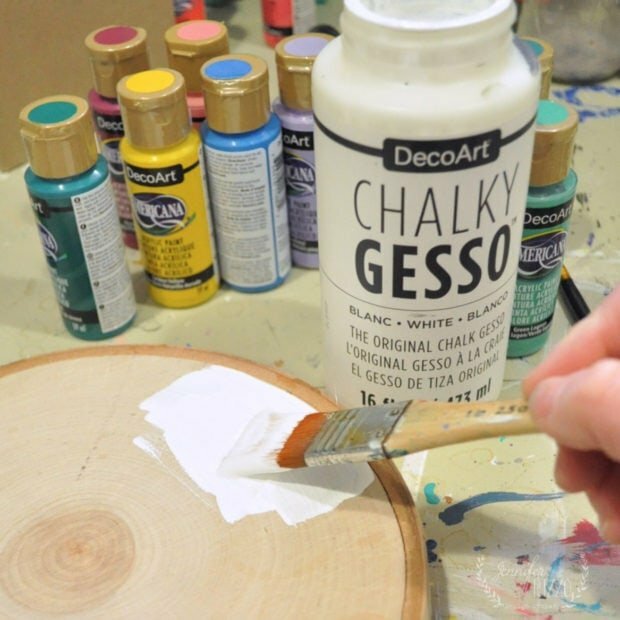 Start the project by painting the wood slice with gesso. 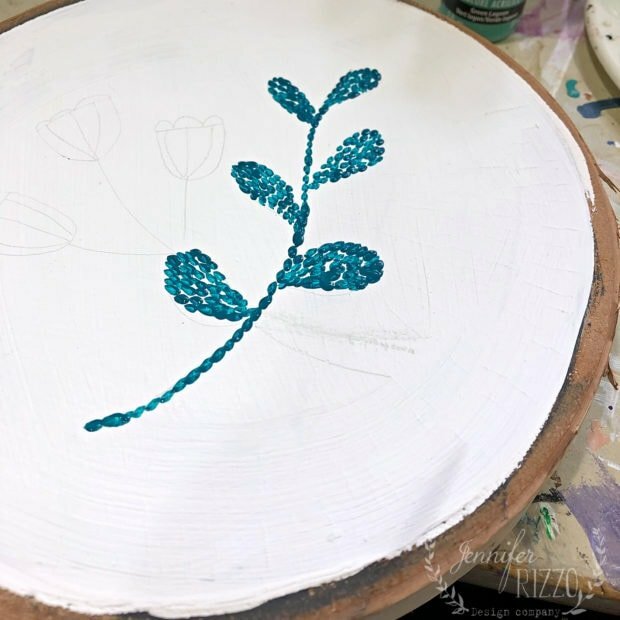 I used DecoArt’s Chalky Gesso in white to give it a base coat. This helps the paint grabs the surface, and the “stitches” pop from the background. 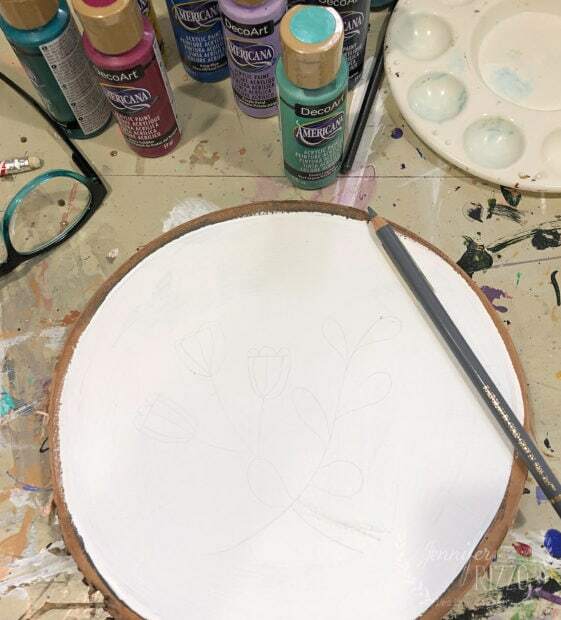 Once the gesso is dried, lightly sketch your pattern onto your surface. 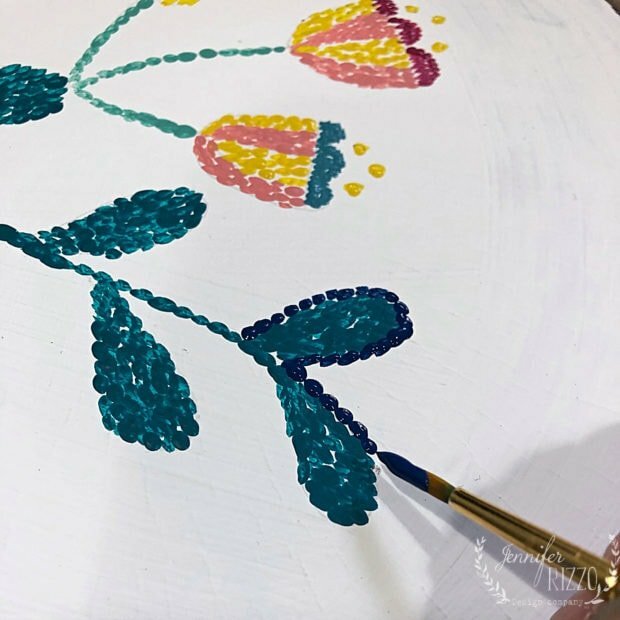 I used DecoArt’s Americana Acrylics in their new colors Vintage Pink,Berry Cobbler,Golden Yellow,Green Lagoon, and Mermaid’s Tail. 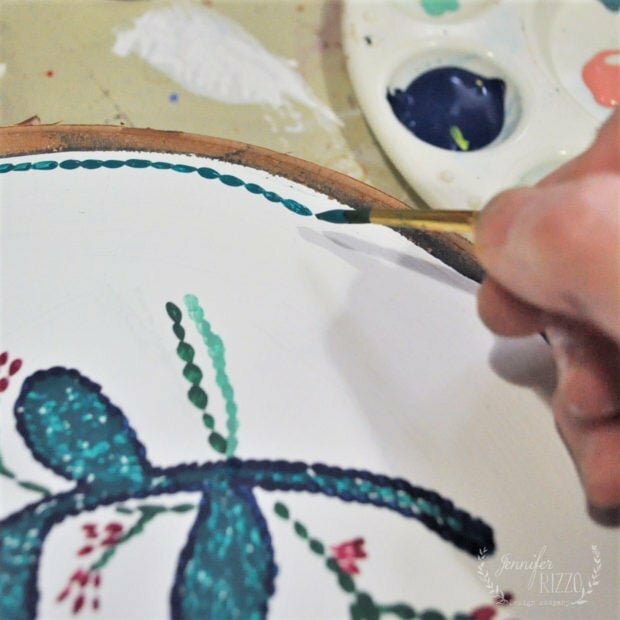 The trick to making your paint strokes look like punch needle embroidery is to use a thin brush. When you touch the end of the brush onto the surface, push down slightly to lengthen the stroke, and then lift up right away. This will create the “stitch”. 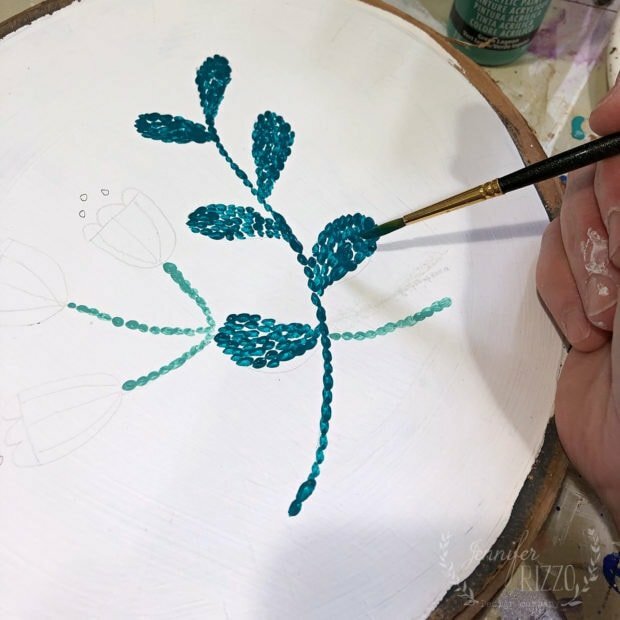 It’s also important to have the brush strokes moving in the same direction like how real embroidery does. Finally, when doing longer running stitches, that each end touches. This will give that embroidery-like look. Dip the tip of your paint brush in the paint an off-load a little paint onto a paper towel so it doesn’t have a “globby end”. Use a practice surface like a piece of paper. It’s always a great way to test your strokes out before jumping right onto the surface of your project. Start creating “stitches” with your brush. 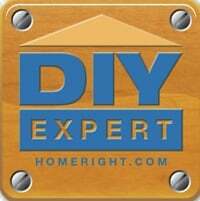 When painting, turn the wood slice instead of your arm or the brush, to change direction on the brush strokes. I found it helpful to work in different sections when I needed to change color, and then return to an area once it was dry. This will help to keep the punch needle embroidery painting stitching from smudging. Also, let the paint run a little low on the brush before reloading to get color variations and tones in your pattern. It’s also OK to have some white space between the stitching, but you don’t want huge gaps. You can also go back and touch up in areas where there is a little too much background showing through… but less is better than adding too much, and making it too solid. 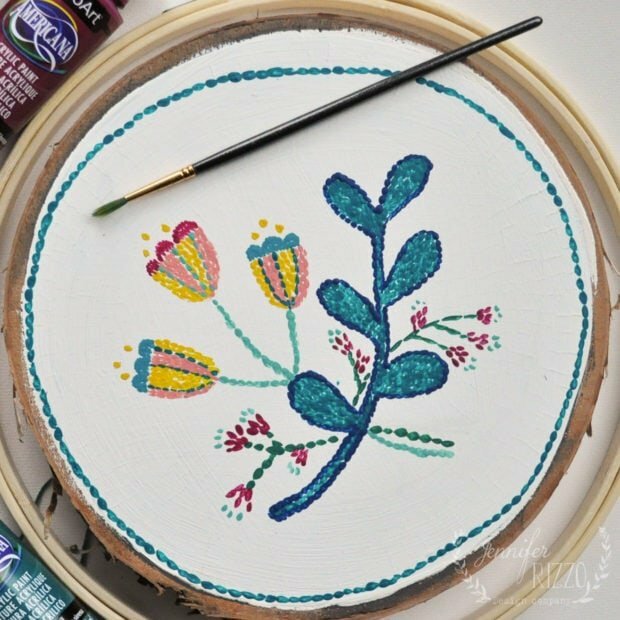 I’m happy that punch needle embroidery painting does look like stitching! I’m excited to play around a little more with this technique on fabric with fabric paint for an “embroidered look”. This post was sponsored by DecoArt, opinions are entirely my own. Do you still offer the Santos Cage doll class? Hi Jeanne, The workshop registration is still open! We would love to have you! 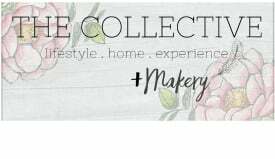 You can go to https://thecollectivelhe.com and look for the link in the menu on top.